Picnics are a must now that the weather is warming up and the grass is greening. Everyone loves a good picnic because it involves food, family & friends and fresh spring air. 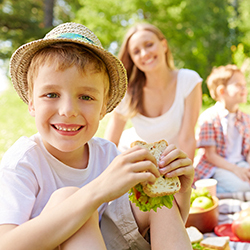 Plan the perfect picnic with five tips that will ensure everyone has a good time. Simple Menu: Picnics are enjoyed when the food is equally delicious and simple. Pack all your family favorite foods like sandwiches, chips, fresh fruit, drinks and treats. Location: Location is just as important as the food. Make sure you pick a picnic spot that is shaded for eating but also sunny for when the food is gone and it’s time to play. A neighborhood park is perfect for kids so they can eat and then burn off energy on the playground or in the fields of green. Make sure your picnic spot has on-site amenities (restrooms). Seating Needs: Depending on location you will need to figure out your seating needs. If your location has tables don’t forget a tablecloth. If your planning on a more traditional picnic remember blankets, lawn chairs or mats for your family to sit on. Have fun: Picnics are a great way to make memories during the warm months of the year. Plan fun games to play while the family is eating or after. And don’t forget your camera to capture these happy moments.